How Will Trump’s Tariffs Work? President Donald Trump has imposed billions of dollars of tariffs in recent months, targeting U.S. allies as well as competitors in the name of national security. These measures are part of Trump’s “America First” strategy, designed to force countries to negotiate new deals with the United States. Instead, Trump’s tariffs are igniting a trade war with the world. Canada, Mexico, the European Union, China, and other countries have retaliated with massive tariffs of their own. If such negative responses have you wondering, how will Trump’s tariffs workto make the country more secure, you’re not alone. Here are answers to some common questions about how Trump’s tariffs have been working so far, and what we can expect in the future. Tariffs are taxes that are added to the price of products that are imported. They are usually charged as a percentage of the selling price, collected as products enter the country. Tariffs are a funding mechanism that can generate significant revenue for a country’s government – the U.S. government collected $34.6 billion in custom duties and fees in the last fiscal year. Tariffs are also used to protect domestic industries from foreign competition. Increasing the cost of imported goods makes home goods more affordable, which can help protect domestic industries. Tariffs can also be raised if a country is subsidizing their products in order to gain an advantage in a particular market. 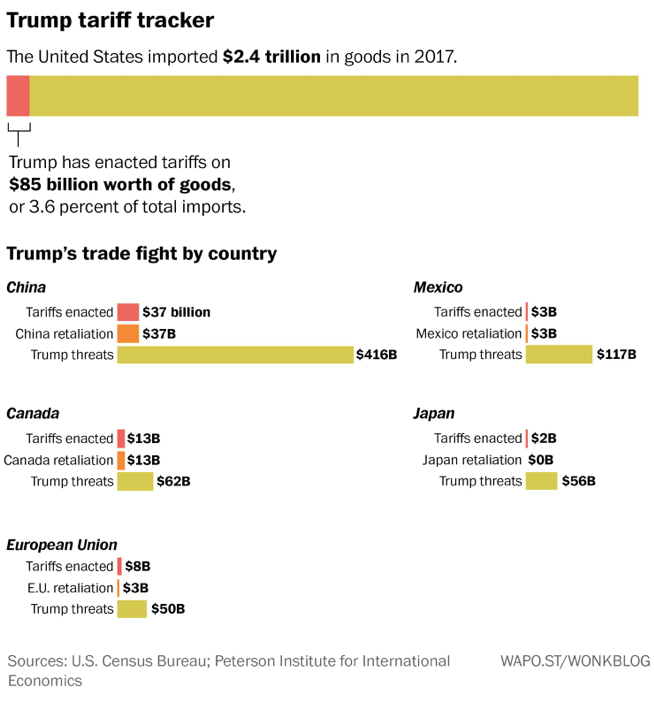 How have Trump’s tariffs worked so far? Trump began his punitive tariff policy in March by increasing tariffs on steel and aluminum. The idea was that raising tariffs would force other countries to renegotiate trade deals so they would be “fairer” to America. Rather than backing down and lowering prices, the targeted countries responded in kind. China, Canada, Mexico, and countries in Europe imposed their own tariffs on American goods. As Trump has escalated the growing trade dispute by imposing steep tariffs on Chinese imports, China has retaliated by levying tariffs on American goods in the same amount. Thousands of products are now affected or threatened by tariffs. Instead of generating more revenue for Americans, the intensifying trade war has led to deep losses in some sectors, particularly farming. The estimated impact from the retaliatory tariffs is severe enough that the federal government is providing $12 billion in aid to those affected, most going to subsidize farmers whose livelihood has been threatened. How do US tariffs compare to other countries? Members of the Trump administration have claimed that raising tariffs is necessary because the United States has the lowest tariffs and the lowest non-tariff trade barriers in the world. 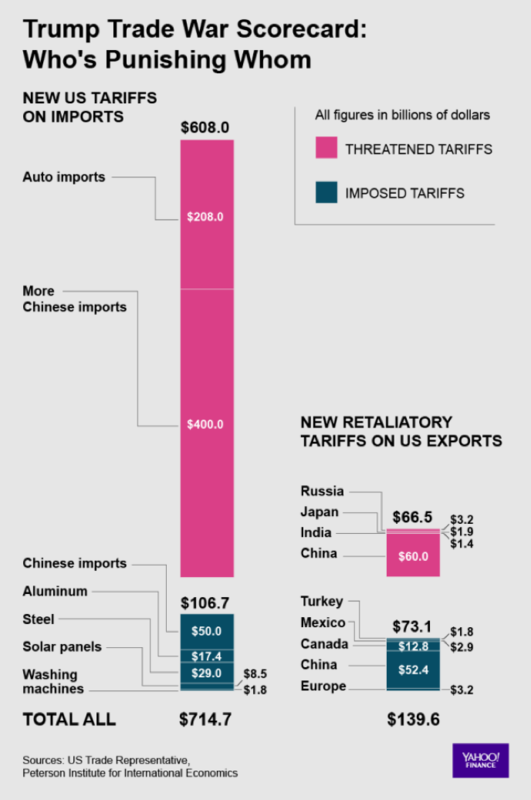 Figuring out exactly where the US tariffs stand in relation to other countries is difficult. Tariffs can vary greatly for different products, and most countries impose some high tariffs for certain politically sensitive products. Non-tariff barriers such as import bans, export subsidies, and bailouts also play a role in pricing wars. 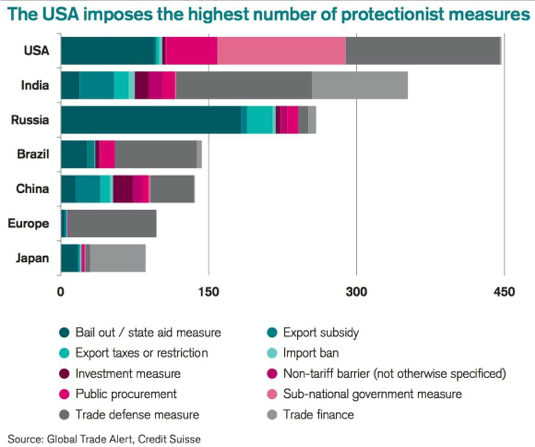 A 2015 report from Credit Suisse concluded that the US has more non-tariff barriers and other protectionist measures than other major countries. What fallout can we expect from Trump’s tariffs in the future? Trump’s trade war with China shows no sign of ending any time soon, and that’s not good. Trump has threatened to impose punitive tariffs on as much as $550 billion worth of China's exports, and China announced it would impose an equivalent amount of tariffs in response. The Trump administration’s latest list of targeted items includes components used in many electronic items, which may cause prices to spike on a whole range of consumer goods. A number of US companies have already announced layoffs or moved some operations overseas. 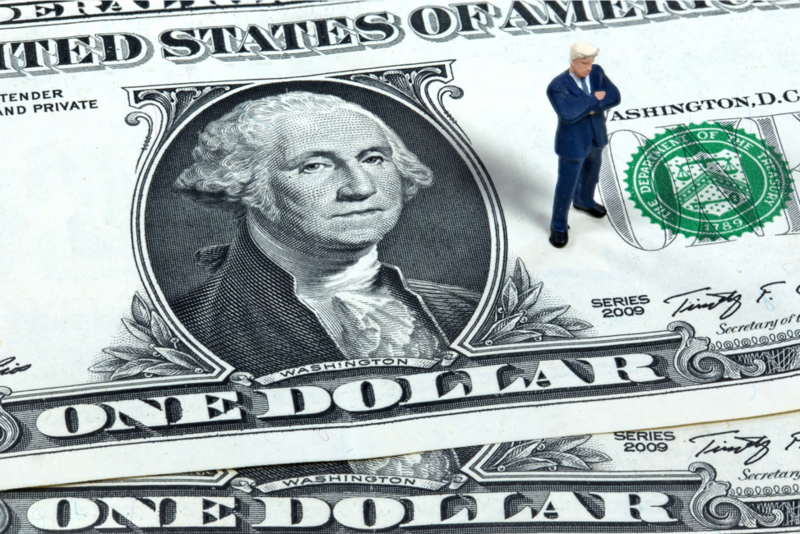 There is some concern that Trump’s trade warcould eventually affect the dollar’s reserve currency status. Although China will eventually run out of American goods to levy tariffs on, experts fear that won’t end the trade war. Instead, China may begin penalizing American companies that do business in its country. As Trump’s trade war continues, it makes sense to reassess your portfolio. If you are concerned about the distribution of your investments, or would like to schedule a review of your retirement plans, reach out to skilled financial planner Matt Logan at www.Mattloganinc.comor call 336-540-9700.